Oh no! I know how frustrating that can be. I’d love to help you figure out what went wrong- did they fall apart as you were trying to form them into patties, before baking? If it was before, then I can tell you right now: adding an extra egg probably hurt you, not helped. 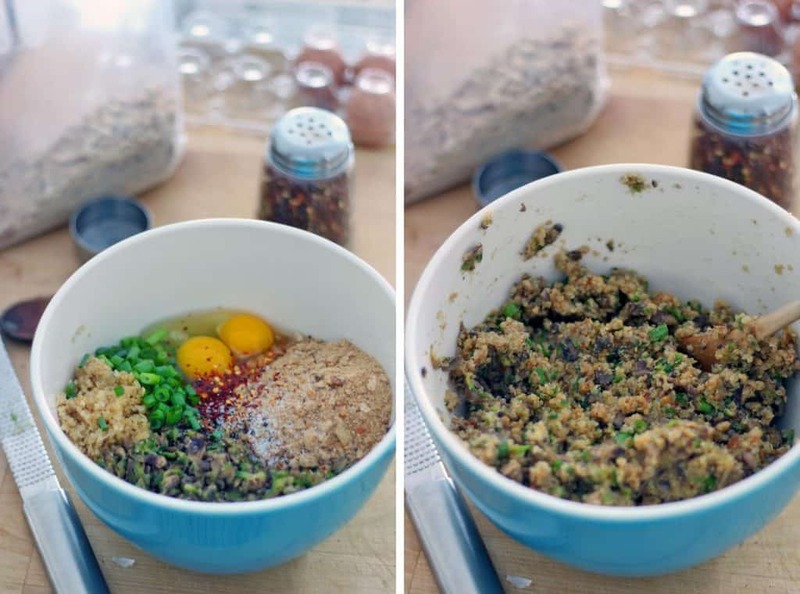 What you need is a little more bread crumbs, which help soak up the liquid from the veggies and eggs to make the mixture more firm and therefore stay together a bit easier. Speaking of liquid from the veggies, it’s also VERY important to get as much liquid out of them as possible before adding them to the mixture. I sauté them until they’re very well cooked and the liquid has evaporated as much as possible, so when I move them around in the pan there is absolutely no liquid left at all. If, however, they fell apart after baking, then it’s possible you had the opposite problem: the batter was too dry. If it’s too dry, then they may crumble apart after baking (in which case, fewer breadcrumbs or an extra egg would help). Anyway, hope that helps, and better luck next time! Hello! These are super yummy, so glad I found your site. The recipe made way more than we could finish. Any tips for storing? I only cooked 1/2 the batch.. So happy you like them! I would “flash freeze” them by placing them on a parchment covered baking sheet, uncovered, and popping in the freezer for about 20-30 minutes, until they are pretty frozen. Then, transfer them to an airtight freezer bag or container. Flash freezing them will prevent them from freezing together and sticking, so you can remove one at a time when you want to cook one up. Hope that helps! 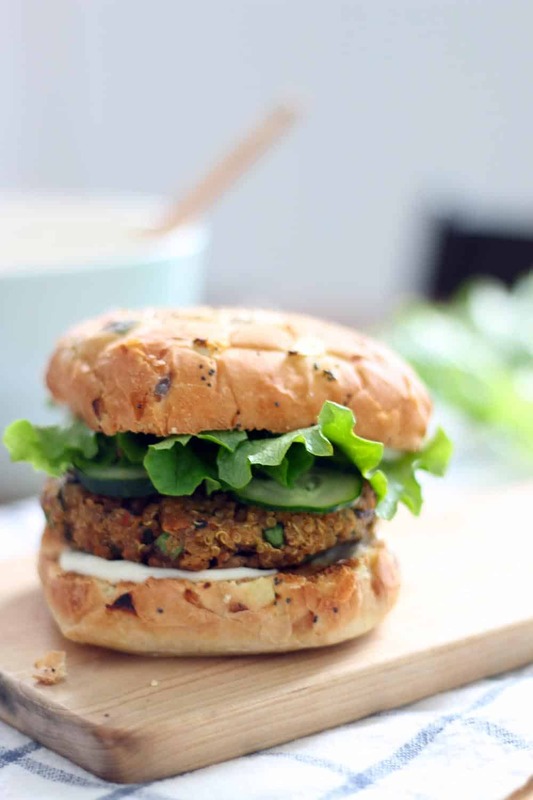 This is a delicious DELICIOUS veggie burger. My daughter detests mushrooms but didn’t even realize that there were mushrooms in the burger. SCORE! I suggested we add a slice of cheese and ……She said ” This burger is so good it doesn’t need anything with it” My sentiments exactly. Thanks for a great recipe. We subbed in Oats instead of breadcrumbs because we need to be gluten free. I will make this whenever I need an excellent veggie option for a large picnic or gathering, or just for a wholesome meal. THANK YOU! I’m so happy you and your mushroom-hating daughter loved it!! :-) Love the idea of using oats instead of breadcrumbs for a GF option. Thanks for the tip! These were amazing! I used gluten-free bread crumbs and they were delicious! 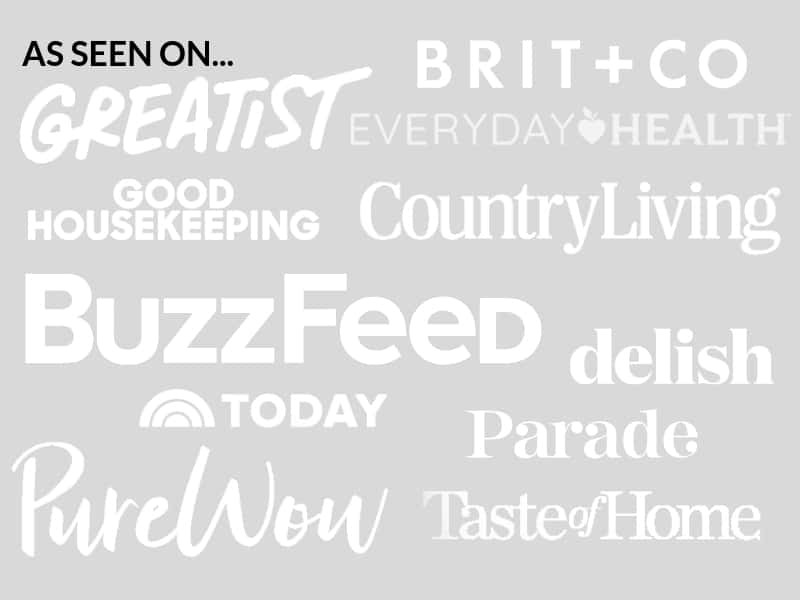 I’m not quite sure how I stumbled on your site – but I can’t wait to try some of the other recipes! Hello, I would love to try theses burgers, but can I make them without the bread crumbs? Would you suggest substituting something else for the bread crumbs? No matter what I tried, these crumbled apart. Complete waste of time and money. Want to leave 1 star, but selecting only one selects all 5. BEWARE! 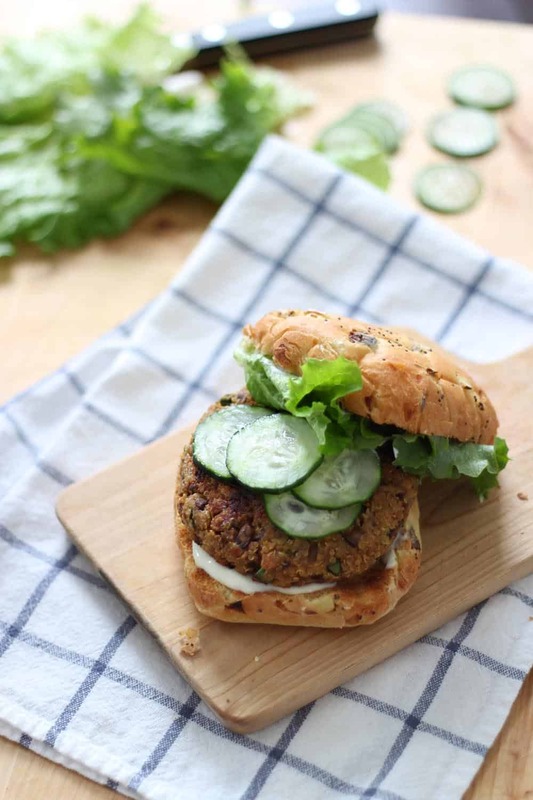 I’ve often made veggie burgers that crumbled apart, and it can be very frustrating, so I’d love to offer some troubleshooting advice for next time (for these or other veggie burgers). The biggest factor is too much moisture from the veggies. For this recipe, make sure to sauté them with plenty of salt (which will draw out the moisture) over medium-high heat (or sometimes even high, depending on the power of your burners). This, plus barely stirring them while they cook, will allow most of the moisture to evaporate from the heat- it’s important to be patient during this step, I know I’ve rushed it before which led to crumbly burgers. On that note, it may be worth checking that the quinoa is as dry as possible too, meaning when you cooked it, it absorbed all the water and wasn’t left sitting in any. In addition, One reader mentioned she added an extra egg to help bind the patties together- the egg solidifies when the patty cooks, helping to make it more solid. Finally, something else that can help is refrigerating the mixture before forming the patties, since the coldness will help it stick together a bit better (and I’m actually going to add this as a note to the recipe card, based on this feedback!) :-) If all else fails, you can also bake the patties- since there is less handling of them, they cook away slower in the oven and stay together a bit better than trying to flip them. Since you said that “no matter what you tried” they crumbled apart, I assume that means you already tried many, many tricks for getting them to stick together, so I’m not sure if these suggestions are helpful or not- but thought I’d pass them along! Hopefully they will be helpful for other readers. With regard to the ratings on the recipe card- thank you for bringing this to my attention. I experimented with it and found that it didn’t work on my phone, but it did work on my desktop computer. Hopefully the company that runs it can get that glitch fixed- I’ll contact them to try and figure it out! Yum!! Great flavor!! Mine had a little trouble sticking together so I ended up adding an extra egg. Used a lot less cayenne and some fresh thyme- so good!! Great results. Big hit in my house. All I had was 2 zucchini and 8ounzes of mushrooms and it still worked. I used chilli powder instead of flakes and it was not spicy enough. I ended up making the mayo, garlic lemon sauce and added more chilli and it made the burgers pop with flavour. Yay! So glad you and your family liked it! That’s what I love about veggie burgers- the amount of ingredients is very forgiving. Love the idea of adding chili to the mayo. Thanks for coming back and leaving a comment! When you freeze these how,do,you reheat them? I usually just pop it in the microwave for a few minutes! Can you bake these burgers instead of frying? Absolutely! They won’t get as much of a crispy sear on the outside, but I bake my veggie burgers all the time when I don’t feel like getting a pan dirty :-) Use parchment paper and flip halfway through. Thanks! I realized later that I fried them on medium heat, not medium-high, so hopefully changing that helps. Also, I may try adding an additional egg…my bowl of ingredients looks a LOT bigger than yours, and my eggs were small. Hi Elizabeth, I’m going camping this weekend and would love to bring these along. Have you tried them on the bbq? Any tips if I go that route? 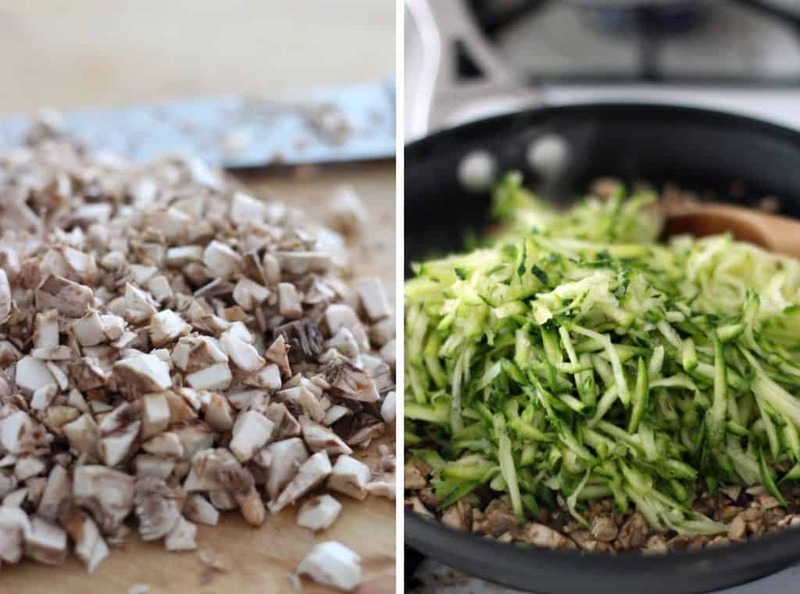 Sounds so fun, and what a good idea to bring healthy stuff to cook with you! I have not tried them on the bbq, but I would definitely recommend baking them in the oven before you go, and reheating them on the bbq. Otherwise, I fear they will turn into a mushy mess on the grill! You can probably skip the searing part if you do this, since the grill will hopefully brown them up a bit. If you want to cook them from scratch on the bbq, I recommend bringing a cast iron skillet or something that you can put on top of the fire with a flat surface. Hope that helps, and hope you have a good time! Can’t wait to make these tomorrow! just wanted to ask, if you are going to freeze the burghers, is it best to do it before or after they are cooked? thanks! I usually cook them, then freeze them. That way, all you have to do is defrost them/warm up in the microwave for a minute or so, and it’s ready! It saves a lot of time. I hope you like them! Wow! It takes some time to make these, but I swear I’ll never buy store bought frozen veggie burgers again! So glad you liked them, Susan! I agree- they take a while, but they are totally worth the effort (especially if you are able to freeze some for a later time! ).